Here are some of the best free apps, app updates and new apps that have landed in the App Store recently. 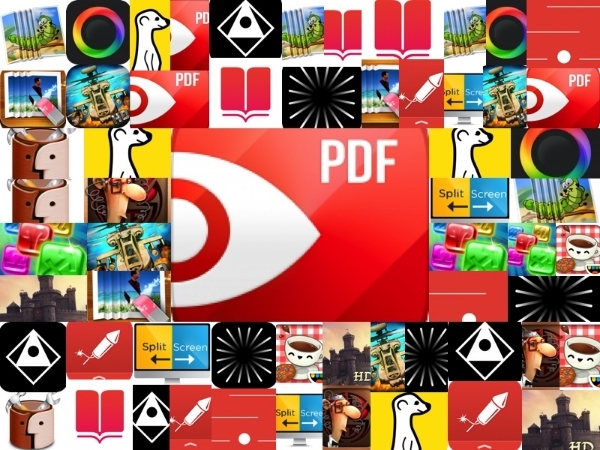 Today's notable apps include a 50% discount on PDF Expert 5, the exciting new TouchTone, and a long-awaited update to Launcher. All app prices are USD and subject to change. Some deals may expire quickly, so grab them while you can. Dark Echo [Now free, down from $1.99] Trapped in darkness, you must use visualized sound to guide your way through threatening environments. Apple's App of the week. Photo Eraser for iPhone - Remove Unwanted Objects from Pictures and Images [Now free, down from $1.99] Photo Eraser is an easy-to-use image editor to remove unwanted objects from your photo, such as date stamps, watermarks, text, building or anything else. Quick-R [Now free, down from $0.99] Test your accuracy, focus and patience. By avoiding obstacles with your finger, you need to keep calm to beat your best time. Rune Gems - Deluxe [Now free, down from $2.99] Rune Gems is an excellent, well-presented game, friendly to both long and short play sessions. Rune Gems [Now free, down from $1.99] Rune Gems is an excellent, well-presented game, friendly to both long and short play sessions. IQ Mission [On sale for $0.99, down from $2.99] In an extra-special mode, we recruit you to become a special agent. Will you take on the job? Your first mission is code-named IQ. Toca Tea Party [On sale for $0.99, down from $2.99] Set the table, choose your favorite cookies and cakes, serve the tea and you’re good to go! Simply eat and drink with your finger! With Toca Tea Party, you can play together with your kids in a way that stimulates their imagination. Avadon: The Black Fortress HD [On sale for $4.99, down from $9.99] Avadon: The Black Fortress HD is an epic, old school fantasy role-playing adventure, with a fascinating story and 40+ hours of gameplay. Split Screen [Now free, down from $6.99] Best Split Screen app since last 5 years. iResizer 3 [On sale for $0.99, down from $9.99] iResizer scale an image without changing important visual content such as people, buildings, animals, etc. Tweak and Tuneup [Now free, down from $17.99] Tweak and Tuneup is a collection of massive powerful tools to enhance the performance of your Mac. NeuBible [$1.99] NeuBible is a modern Bible app thoughtfully designed for the most delightful, distraction-free and considered reading experience imaginable, and to help make reading the Bible personal again. TouchTone [$2.99] Join your fellow citizens to decrypt suspicious messages and help make our nation safer and stronger! For every puzzle you solve, for every dangerous message you bring to our attention, you make your family and your country that much safer. Priime [Free] Priime lets you edit your photos with filters created from the styles of the world's top photographers. PICSPLAY 2 - Photo Editor & Selfie Retouch [Free] PICSPLAY™ is the ultimate photo editor, filled with filters and editing features that professional photographers just can't get enough of! Added ability to decrease size of the launchers and hide labels for Pro Version users. Fix for issue with adding a new launcher when a row is filled which only affected the iPhone 6 Plus. Fix for a possible crash when deleting launchers. Fix for not being able to choose an email address for Facetime or Messages launchers. Added ability to choose a contact for WhatsApp. Removed the Sponsored Launcher in the free version. Removed Sponsored Apps from App List on Pro Version. Removed Facebook and Twitter buttons from main view in Pro Version. Simplified the layout of the app lists so you should have less problem finding the apps you want. Search any user and follow!